My name is Freeba and I want to tell you my life story. When I was twenty-five years old I married. I was young, and pretty too. I knew little about the hotness and coldness of life, how quickly things can change, how life could play with me. From the time I married, I suffered cruelty. I had a cruel mother-in-law and six sisters-in-law who were cruel to me as well. They made my life insufferable with pain and injustice. They made my life like a prison. My husband treated me poorly. He would often fight with me and punish me for nothing. Even though he had me as a wife he soon married a second woman. She too treated me with cruelty. My husband understood my suffering, yet he was nice to his second wife and to the many children she had with him. She would say things against me to him and he would believe her. She put these bad words about me into his ears and he would not defend me. All of my husband’s family, his mother and sisters, his second wife and her children, had hearts like stone and they would beat me, pull my hair, and burn me with hot water. I wanted to go to my brother’s house and tell my brother about how I am suffering violence, but I didn’t. I continued to live in my house. I said to myself that life is like this. Even though they treated me like one of the animals, I continued to behave with respect for all of them. I prayed that I wouldn’t be hurt, and continued to do all of their work. I had no rights and no one to care for me. My life today is very bad still. I live with my husband and his second wife and their children, and work for them as a servant. I want to know why the violence against women has not ended in Afghanistan. Why is it that I should live with no rights, and be so unhappy? 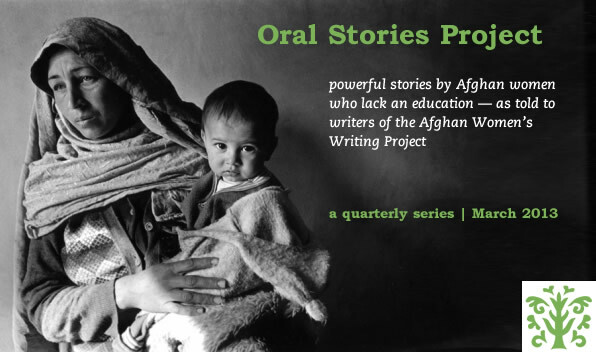 Editor’s note: This story is from an oral interview with Freeba conducted as part of the March 2013 AWWP Oral Stories Project. It is not right at all that you should live with no rights. You should be able to leave this situation.I hope that telling this story may help. This story is heartbreaking and I am sure not a rare case in Afghanistan. The poor women who are mistreated by women as well as by men in their families. One thing that really bothers me about stories like this is what this lady, Freeba, has said in telling her story: ” I continued to behave with respect for all of them. I prayed that I wouldn’t be hurt, and continued to do all of their work.”. As much as I know women are helpless and do not have any support and can not defend themselves completely, I can not help but dislike the quoted above sentences. This is not self respect, the whole grand idea of martyrdom is not acceptable for me. Instead of the good woman she thinks she is to pray for herself and carry on serving the abusing party, the least she could have done for her self respect was to REFUSE doing their work , for protest of their treatment of her. If she does not respect herself and care for herself, how can she expects others to respect her and care for her. I can not help but wonder that if someone beat me, I would refuse to do work for that person, sure he will beat me more but at least it will be my way of standing up for myself and not complying with the bully. I think it is time women learn how to put value on their own feelings and on themselves first and foremost. They need to learn to fight this cruelty not aid in promoting it by complying with it and just ” pray and respect”, it is good to pray and respect but it is even better to learn how to stop being abused and how to protest something that is inhumane. Wish all the abused women to get the strength to find their self respect and self value and be treated with RESPECT and humane. Wow! You really have not been on the receiving end of a violent man and scheming women. Freeba was abused and broken. Look at the condition of prisoners of war they come home traumatised in the same way. My advice to Freeba is find a womens group, then plan carefully your escape. . Tell no-one of your plans not even family and remember the first four letters of your name. My gut reaction was strongest to this comment. I can relate to that, as somehow women are prone to self sacrifice. This is probably the first line of defense in our treatment world wide- believing we have the right as individuals and collectively- to be valued and first class citizens. Unfortunately I think Freeba had already internalized these feelings before she was married. Religion is used to support this attitude toward women and to condemn and enact other forms of violence. It is not however, God’s way. Thank you for sharing your story. They can beat you down, but they can not take away your mind, and I admire you for sharing your voice with the world. Sending prayers your way. i feel very bad to hear your story. fareeba instead of dying every day why dont you leave your husband and start a new life because life comes once so dont waste your life with the person who dont have your value. You are brave and I am angry that this family will treat you this way. You should let them know the reason you “take care of them” is because they are your FAMILY and you should be treated as family as well. This story is very heartbreaking. It spoke to me as even though you live such an unfair life, you don’t want to seek help from others (e.g. your brother). You are a really brave and strong woman. You are sacrificing yourself and doing everything you can for your children. You have human rights. You or anyone doesn’t deserve to be treated this way. However it frustrates me that you still live with them; you should be able to live a better life. Thank you for sharing your story.